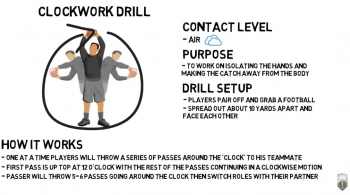 To get players loose, work on conditioning and how to take a ball handoff securely. 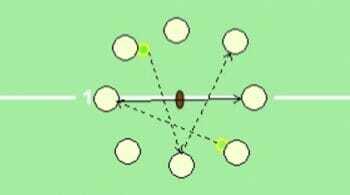 Divide the team into two groups, and have them form two single file lines. Place a cone directly in front of each line, with another cone 15 yards down field. The first player in each line should have a football. 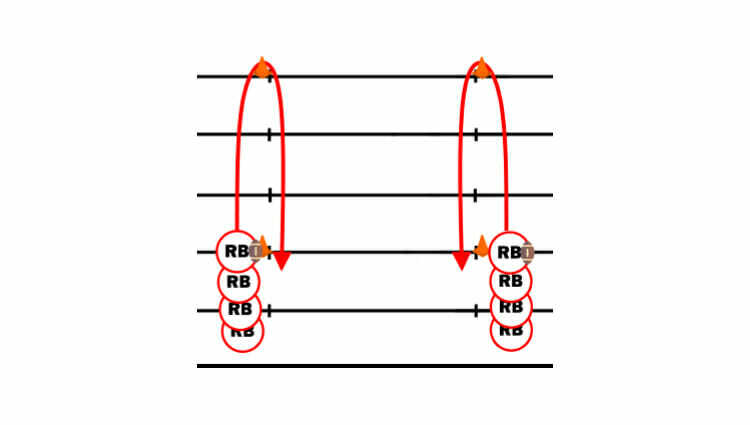 On the coach’s signal, the 1st player in each line will hand the ball off to the 2nd player in line. The ball carrier will run down and around the far cone and back, handing the ball off to the next player in line as they cross the start line. First team to get through all their players wins! You’ll want to get in close and watch as players take handoffs and make sure they are using the correct technique. They should have their inside arm up, bent at the elbow, with the outside arm underneath, forming a breadbasket that clamps down around the ball right after the exchange.